Click here for additional information about cowardly U.S. agencies and departments. The fbi and the cia think that they control Thailand, but soon they will learn to re-think their roles there. 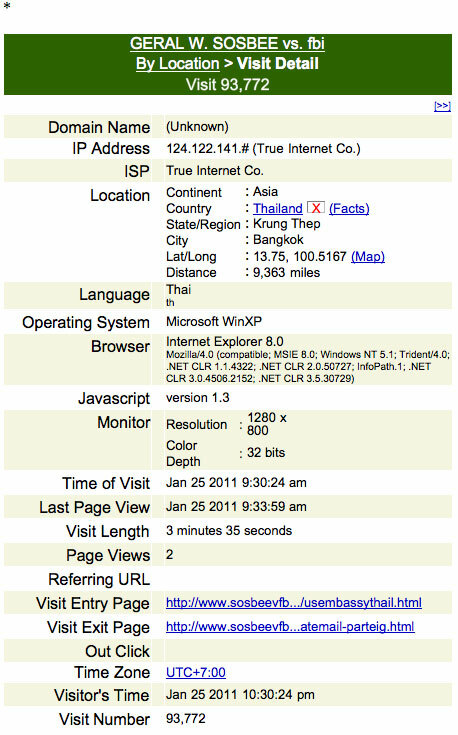 This update is in response to a threat delivered to me today from the fbi/cia agents and operatives in Thailand: "if you come back to Thailand you will again be treated as , 'insane criminal cases in Thailand' ". Reference is made in the threat to my remarks on Thailand. During my 3 months stay in Thailand these low life and cowardly punks terrorized me by kidnapping, drugging, surveilling, assaulting, provoking, etc. I was in effect under their control most of the time because I was often unable to get out of bed from the effects of their crimes committed on my person. I was in a sense blind folded with my hands bound behind my back as the Thailand punks came at me from all directions night and day, seeking a way to arrest me on any charge. All of this was at the direction of the fbi. The fbi and the cia rule every aspect of the Thai society as may be deemed appropriate. The two corrupt agencies of the United States employ Thai citizens as assassins and as 'AGENT PROVOCATEURS '. Often the Thai operative for the fbi/cia is of Chinese ethnicity and the ones I met were sociopathic in their approaches to me. The astute Thai citizen is aware of the Chinese thugs operating as government assassins and the Thais don't like it. I suspect that when the Thai proletariat learns of the total corruption of their government , a nasty backlash will occur. The fbi and the cia, however, are so entrenched in the Thai society that the people who seek to correct the inhumane abuses of power there will be murdered, imprisoned or tortured. The only real alternative for the Thai, in my opinion, is to remove the King and to throw out the fbi and the cia and any other hint of US imperialism in the country; I hope that this can be done peacefully; however, the fbi and the cia do not allow peaceful revolutions; there is no gain in that. Meanwhile, China is no doubt infiltrating Thailand with China's own and best double agents, so that the US control over all of SE Asia may become an illusion. The most cunning of all spies are those who can play both angles at the same time: cause a bloody revolution or kill specific Targets and simultaneously seek diplomatic and aesthetic solutions to complex socio-economic issues facing the nation. To the cowards who threaten me again: you failed to arrest me there and the fbi/cia fail to arrest me here. I ask you, punks, the same question that you frequently asked me during many of your assaults: "Where you going" to run when the people learn of your subversion of their country? The Thai government allows the fbi/cia assassins to engage in crime sprees against Targets in Thailand as I have described. Thailand officials *re-visit this site to review the above statements which invite the government thugs there to come out of hiding and to state exactly why they allow the fbi/cia assassins to run their country at will.